In this day and age when our society&apos;s focus is on everything modern and cutting edge, there is a new shop in Hendricks County that&apos;s all about remembering this area&apos;s people, their ways and their accomplishments of the past. 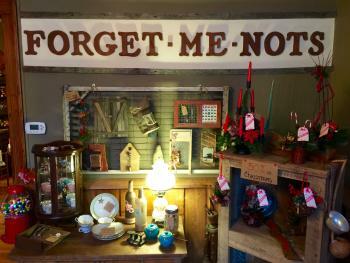 Forget-Me-Nots, located at 127 S. Washington St. in Danville, is owned by Cindy Petty and Chris Threlkel -- two friends who share a passion for history and for bringing new life to old forgotten barn wood. Their shop, located a few doors south of the southeast corner of the historic Hendricks County Courthouse Square, utilizes a building that was constructed in 1850 as a buggy repair shop. Later in its life, the historic building housed an interior design and floral design shop owned by Cindy&apos;s mother. The store&apos;s name at the time? Forget-Me-Nots. So about six months ago, when the two retired friends decided to combine Cindy&apos;s eye for décor with Chris&apos;s woodworking skills into a business, the location and the business name were both quite obvious to them. 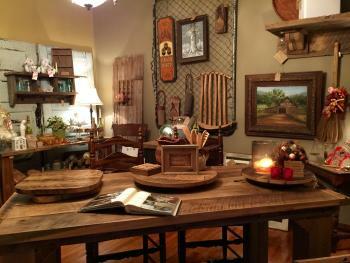 Forget-Me-Nots is a shop filled with handcrafted furniture, décor, toys and other items that are made by Chris out of wood salvaged from historic Hendricks County barns. When property owners contact him about removing a barn, Chris takes the structure down, salvages what wood and materials he can, stores the wood in his workshop at home, and then designs and creates fantastic pieces out of that wood. And if you ever doubt that what he creates is made with tender loving care, take a stroll with him or Cindy through the store, and they can tell you where every piece of wood on every creation came from, what kind of wood it is, where the barn was located, who owned it throughout history, what the barn was used for in its heyday and what was going on in the area at the time. It&apos;s really amazing. Cindy showed me a piece that Chris had just completed -- a unique wood wall-hanging with metal lettering on it that spelled "home." It was a really neat piece, but when Cindy told me that Chris hand-cut the metal lettering out of the roof of a salvaged barn, that made it even cooler. It&apos;s a small piece of history right there in your home. Nearly everything in the store is one-of-a-kind because Chris envisions and makes whatever the salvaged wood allows him to create, given its size, shape, wood type, grain, etc. As you might imagine, custom orders make up an integral part of Forget-Me-Nots. If you can explain the concept of what you want made, Chris will build it for you. I was really surprised by how reasonable the prices in the shop are, considering the labor involved in each piece. For example, Forget-Me-Nots had three lazy Susans available while I was there, each one made by Chris out of a different type of wood. One of them I liked was made out of white oak, and of course, Chris and Cindy were able to tell me exactly which Hendricks County barn the wood came from and the history of that barn. I liked the size and the design of the white oak piece, it spun nicely and it looked and felt sturdy enough to spin three elephants around on it (I didn&apos;t actually test my theory because I left my elephants at home, but it seems plausible). I figured Chris took this barn down, transported the wood back to his shop, thought about how he wanted to design this lazy Susan, spent the time and effort creating this one-of-a-kind piece, finished it beautifully, told me the history behind it and it will last forever. It&apos;s got to be worth $100 to $200, I&apos;m thinking. Maybe even more. What is it actually priced? I&apos;m not telling you. You have to go see Chris and Cindy at Forget-Me-Nots to find out for yourself (hint: it&apos;s much, much lower than my estimate). Wander through history at Forget-Me-Nots. See what Cindy and Chris have created, and what they can create out of barns that, thanks to them, will now never be forgotten. 127 S. Washington St., Danville, Ind.